(I’ve decided Sunday counts as day one.) 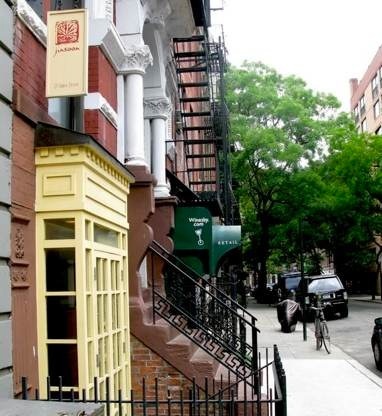 I got a pedicure here, at Jin Soon Natural Hand & Foot Spa on Jones Street, a nice quiet block in the West Village. The color I got is OPI’s Venus di Violet, for the nail polish curious. I just finished a great interview, thank you Deborah Harper, of Psychjourney! But now I have to interrupt my Birthday Week festivities to do some actual work. Ha. Such a hard life I have. The interview was technically work, but it was so much fun I can’t count it as work. The stuff I have to do now counts. Maybe I should bittorrent a good movie to watch after? And, THAT alone should give you even more to celebrate. Here’s hoping I’m the first to wish you a Happy Birthday! You are the first, thank you!! Happy Birthday from San Francisco! I ordered your ‘Unbelievable’ book and just got a call that it has arrived. The world is filled with mystery and wonder as Nicole stated and I hope that you find both during your birthday week. Cheers! Thank you Cathy! And thank you for ordering my book!!!!! !